I would like us to spend a little while thinking about the very first member of the church. The very first person to see the risen Lord Jesus, the first person to respond to him, the first person to tell the good news to others, was not one of the Apostles, but a woman, Mary Magdalene. Let’s discover how Mary became a member, the first member of Christ’s New Testament Church. Then let’s think what that means for us too. Mary Magdalene appears in all four Gospel accounts of the death and resurrection of Jesus. From these we learn that Mary Magdalene became a friend and follower of Jesus after he cast out 7 demons from her. She was present during Jesus’ trial (Matthew 27:45). She was there at the Crucifixion (John 19:25). She watched Joseph of Arimathea bury Jesus (Luke 23:56). And on Easter Sunday she and some other women were the first to discover the stone had been rolled away (John 20:1), first to meet the risen Lord Jesus (John 20:15-16) first to tell the disbelieving disciples the good news (John 20:18). Surprisingly, it was also Mary and some other women who supported Jesus financially from their income. This tells us something about the value Jesus placed on women. Jesus recruited and traveled with both men and women followers. That was unheard of. When we think of the disciples we tend to imagine the 12 male Apostles, but Jesus drew around him both men and women, into one extended family of sisters and brothers. In this Jesus was very radical. It was the custom that women would only travel with their families. In the Easter story, the Apostle John gives us the fullest account of Mary’s role. As we read John 20 together I want to make three observations about Mary: About her heart, about her mind and about her will. While the disciples were sleeping, Mary was not only awake but working. It was still dark when she went to the tomb. After the disciples had found the tomb empty and went home, it was Mary who stayed behind. She was the first and the last at the tomb of Jesus. That’s devotion. She stood by Jesus through the most difficult of times and her devotion persisted even in his death. Remember that when Mary went to the tomb, she did not expect to meet Jesus. She expected to find a dead body that needed to be prepared for burial. She acted out of devotion even to his memory. What does the word ‘devotion’ mean to you? Is that a word you would use to describe your faith? Are we willing to serve without being asked? When no one is looking? When its inconvenient? When we don’t feel like it? Can we serve when our prayers go unanswered? When our hopes have been dashed? When we don’t have all the answers? Do we serve our sisters and brothers ultimately out of devotion to Jesus? Mary was devoted. The Devotion of Mary. “Then the disciples went back to their homes, but Mary stood outside the tomb crying. As she wept, she bent over to look into the tomb and saw two angels in white, seated where Jesus’ body had been, one at the head and the other at the foot. They asked her, “Woman, why are you crying?” “They have taken my Lord away,” she said, “and I don’t know where they have put him.” At this, she turned around and saw Jesus standing there, but she did not realize that it was Jesus. “Woman,” he said, “why are you crying? Look at verse 10. You might think there is nothing remarkable in those words. But stop and think for a moment what they have just witnessed. The tomb is empty. The grave clothes which a few days before were wrapped with spices around the body of the Lord Jesus are now lying exactly where they had laid His body. And we read that the men… ‘went home.’ ‘They went home.’ Maybe they thought ‘what else can we do?’ Now look at what Mary does – John tells us (20:11), she remains at the tomb weeping. Her grief at the loss of her Lord is compounded now by the loss of His body. This was the last place she had seen His broken, dead body and she will not move from it. The loss of His body is the final indignity. Even her grief has been violated and she weeps. The emotional turmoil of the last days overwhelms her and she breaks down and weeps at the sight of the empty tomb. Yet despite her grief (20:12) she plucks up the courage to look into the tomb for herself and what a sight she is met with. He had died between two thieves. Now two angels sit where his head and feet should be. Between them are the empty grave clothes declaring His resurrection. In verse 13 we read that they ask her a simple question: “Woman, why are you crying?” From the angel’s perspective, tears of grief on this Easter morning were totally inappropriate. But for Mary they are the only way to express her grief. Through tear stained cheeks and grief strained voice she replies: “They have taken my Lord.” Whoever ‘they’ are, they are now her enemies because they have taken ‘her Lord’ from her. There is a simple lesson here. Anything that takes you from the presence of the Lord Jesus, is your enemy. “I don’t know where to find Him.” Do you know where to find him? Mary didn’t, but Jesus knew exactly where to find her. She is courteous, even in her grief. She asks where they have taken His body so that she may get it back. How ironic she asks the very person who is responsible for the tomb being empty. “I am the resurrection” said Jesus, and he is. How often we too can find life in the midst of what we thought was death – because Jesus is there. It is often only when we express our deepest pain and emotion, that we truly encounter Jesus. Mary was there alone in that place of death because she chose to be. She was there because her heart was broken. The devotion of Mary and the emotion of Mary. Jesus utters just one word – ‘Mary’ and instantly, her eyes are opened to who it is who stands before. In John 10, Jesus promised, the good Shepherd calls “his own sheep by name and leads them out… His sheep follow him because they know his voice.” (John 10:3-4). Jesus simply calls her by name ‘Mary’ and her shattered soul is transformed. Her broken world is put together again. It was her own name spoken by Jesus which opened her eyes to the truth of the resurrection. When Jesus calls His sheep He always calls us by name. The call from Jesus is always personal. Mary falls at His feet and clings on to him. She will not let go. She will not lose him again. Then comes the gentlest of rebukes. Jesus tells her not to cling on to Him because He has not yet ascended to the Father. He wants to teach her and us that He will no longer be known by sight or by touch but by faith. After his dramatic ascension to heaven there will be no more earthly appearances until He returns. Just as he promised at the Last Supper. Mary is to go and tell the disciples that Jesus is alive, and she obeys. The devotion of Mary. The emotion of Mary. The submission of Mary. 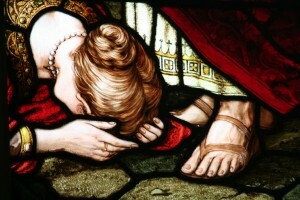 So what can WE learn from Mary Magdalene today? Before Jesus delivered her, she knew the terror of evil and darkness. She valued most highly the glorious deliverance found in Christ alone. Consequently, she gave freely of her time and liberally of her money to serve Jesus. They are always in proportion. The greater the realization of sin, the greater the sense of gratitude. She appreciated her freedom because she knew what slavery felt like. As Jesus said, “He who has been forgiven little, loves little.” (Luke 7:43). Maybe the first lesson we learn from Mary is to be more grateful for what Jesus has done for us personally by his death and resurrection. We may have praised him today but have we thanked him? How will we express it? Demonstrate it? Gratefulness and devotion go together. We can learn to be more devoted in following Jesus. because in your heart there will be a restlessness. In your heart and in your head there will be a battle going on – a battle for you soul and for your eternal destiny. Your heart is restless because you know everything you have heard today, or on previous Sundays applies to you – it is like there is no one else in this church but you and Jesus. He is calling you by name. But to follow him you must first let go of the past and turn away from everything you know to be wrong. We can learn to be more devoted to follow Jesus. We can express more emotion in loving Jesus. Mary fell at His feet in humble adoration – and you must do the same. Either voluntarily of your own free will, or on the day the Lord Jesus returns, against your will. For one day the Bible says we will all kneel. Better to do it today because you want to, than tomorrow because you have to. Jesus told Mary to go and tell the disciples that He had risen from the dead. In joyful submission – she went and told them. She submitted. I think there is the profound lesson here for us. We say we have met with the risen Christ. We say He has freed us from sin and death. Well, who would know? Whom have we told? Perhaps it is time to rededicate our hearts, minds and wills to the risen Lord Jesus afresh, and begin to do as he says? To tell others what He has done for us. That is all he asks. Three lessons we have learnt from Mary Magdalene. Her devotion to Jesus. Her emotion for Jesus. Her submission to Jesus. Mary loved the Lord our God with all her heart, with all her mind and with all her strength. The Scriptures may not tell us much about Mary. But from these few verses we see what membership means, what a fully devoted follower of Jesus Christ looks like. How about you? On this Easter Day I invite you to renew your commitment to Jesus and to his Church family here in Virginia Water. I invite you to pray with me silently, if it reflects your heart’s desire today. By your grace and in the power of the Holy Spirit, I commit all of myself to serve you joyfully and diligently, in and through Christ Church during the year ahead. And I pray this in the precious name of Jesus. And they all said. Amen. This entry was posted in Bible, Sermons, Theology on May 2, 2017 by Stephen Sizer.